Devotion to the Holy Face: A Key to Happiness and Final Perseverance! (The revelation above is taken from the promises He gave her, regarding those who devote themselves to making reparation to His Holy Face). This coming Tuesday (February 9) is the Feast of the Holy Face of Jesus. How I have come to love this devotion! Some have a devotion to the Precious Blood; others to the Holy Wounds; others to the Sacred Humanity; others to the Passion of Our Lord – these are all admirable devotions. But do we realise that devotion to the Face of Christ, in a sense, combines all of these devotions? The Feast of the Holy Face is a truly glorious Feast; if you have the opportunity to attend Mass, you must! At every Mass, the Risen Lord is made present on our Altars; that Adorable Face, which is the delight of the Blessed, looks at us with infinite sweetness, hoping that our eyes will meet His. How blessed are those who make their souls a living Tabernacle for Love Incarnate! How fortunate, we say, was St. Thomas, to have placed his hand in the side of Christ. Do we not realise that we receive the same Christ into our souls?! The Face of Jesus gives us confidence. His Divine Countenance is full of love and mercy; He is love and mercy, and His Face reflects the Love that consumes His Sacred Heart. How often have sinners been converted by looking at an image of Christ! Who can look at the Face of Jesus Crucified and not be moved? Our Lord said to St. Faustina that His Face on the image she had struck (the Divine Mercy image) resembles His expression from the Cross. Similarly, Our Lord told Sr. Benigna Consolata that, while hanging on the Cross, He unopened His bloody Eyes to look with tenderness upon His executioners, upon us! Jesus demands reparation in these very sinful times. Jesus is the Head of the Church; when the Church is persecuted, Jesus suffers (retroactively; He cannot suffer now). Our Lord has revealed to many of His Saints that the world is going to ruin because there is no one to make reparation. “Souls are not saved if nothing is done for them.” (Jesus to Sr. Benigna Consolata) The Face of Christ is suffering much; we must offer It, then, in reparation for sins. To the extent that the Divine Countenance is obscured by the wounds inflicted upon It by sinners, we must adore It. The Face of Jesus is one of the most efficacious means of effacing sins, growing in Divine Love, and saving our souls (as we shall see). Many of the Saints had an ardent devotion to the Holy Face of Jesus; they loved Him by contemplating Him in His sufferings, and in His glory. 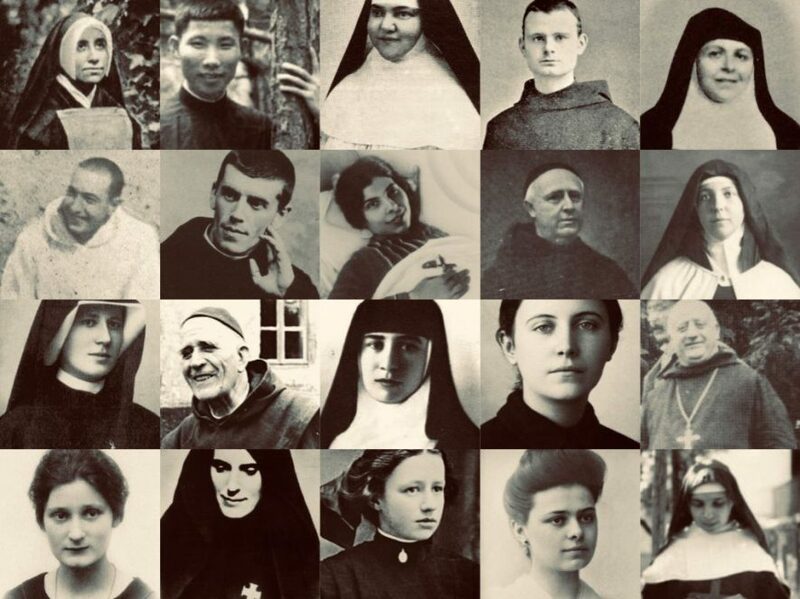 Some of these holy souls include St. Therese of the Child Jesus and the Holy Face, St. Mechtilde, St. Gertrude, Ven. Leo DuPont, Sr. Mary of St. Peter, St. Edmund and Bl. Maria Pierina de Micheli. “Have you not read what is written of Me: Vidimus eum tanquam leprosum? “We have thought Him as it were a leper” (Is. liii. 4). The religious soul, My spouse, says the Lord, is the little Veronica, who wipes My face every time that she mortifies herself: the veil with which she wipes it, is her soul in which I leave My divine Features portrayed. The more pure and spotless the soul is, the more capable is she of receiving My divine Lineaments. If thou wouldst arrive near to Me thou must pass across My enemies, who are thine also, and from whom thou wilt have much to suffer; but the consolation which a single one of My divine Looks will impart, will repay thee with usury. Pause, O good Jesus! I am very small, but I will rise on tiptoe to wipe Thy Face. I will use the very finest linen, the whitest and most delicate; and I will prepare this linen for Thee by my fidelity in three things: purity of intention, charity toward my neighbor, and the most ardent love possible toward Thee; and do Thou, O Jesus, celestial Beauty, give me a perpetual remembrance of Thee! Sources: ‘The life and revelations of Saint Gertrude, virgin and abbess, of the Order of St. Benedict,’ ‘The Love of the Sacred Heart (St. Mechtilde),’ ‘Vademecum Proposed to Religious Souls (Sr. Benigna Consolata),’ ‘Devotion to the Holy Face’ (TAN Books), ‘The Golden Arrow’ (TAN Books). February 3, 2016, marks the 65th anniversary of the death of Servant of God Yvonne-Aimée de Jésus. This privileged spouse of Jesus was the recipient of countless graces, including many extraordinary charismata. She bilocated, she prophesied, she had the stigmata. She was tormented by the devil. She let nothing shake her childlike trust in Jesus, King of Love. She was full of love for God and His Church. She sacrificed herself for others, especially priests. Let us ask for her powerful intercession; that we may give ourselves anew to God each moment, and that we may profit from the light that Our Lord imparted to her. A “Challenge for Lent” from God Himself! It is my great pleasure to share these inspiring words with you on what is the 100th anniversary of the death of Sr. Benigna Consolata, my dear “little sister.” Ask for her intercession and you will come to love her; she is another Seraphic soul, like St. Gemma, St. Catherine of Siena or St. Francis of Assisi. I pray that God will one day raise Sr. Benigna to the Altars! Please join me! Thy Will be done! “If this Challenge, says Jesus, is practiced with love and a real desire to please and console Me, it will cause in the souls of My spouses no little progress in intimate converse with My Sacred Heart, and will lead them to a closer union with Me. In the Order of the Visitation a Disfida or Challenge is a schedule of practices of virtue, given by the Superior to the Sisters at certain seasons, as Lent, Advent, and at the approach of great Feasts, as Christmas, Pentecost. It will be the duty of My dear spouses, their sweetest duty, during Lent to keep Me special company in My Passion, by meditating more frequently on My sufferings, the price of the Redemption of man. Above all, they should be at this time so many other Veronicas destined by love to wipe My Divine Face. understanding, continues Jesus, I will say that it is My intention to make of My dear spouses so many of My living photographs, so that each soul shall see in her Sisters, even in the exterior, this work of grace. The Challenge will be concerned for the most part with interior practices, because it is chiefly the work of the heart; but to these you will add exterior practices also, especially those of charity, gentleness and humility, virtues which unite hearts most closely. 1. It is My desire that hearts should let themselves be penetrated with the salutary thought of My Passion just as a material is penetrated with oil which you drop softly upon it. This is an invitation of Love, without obligation; but it will please Me if the Meditation on My Passion is made at least once a day. For My spouses the thought of My Passion ought to be a bouquet of flowers, borne always upon their hearts. 2. I desire that each soul should keep Me loving company the whole day long, habituating herself to accompany Me in thought. It would be well to choose for this purpose two or three thoughts at the close of each meditation; these one may often recall and so the more easily maintain her union with Me. 3. As love is not satisfied to contemplate but longs also to imitate, therefore each religious soul should determine upon a practice for Lent, to which she shall devote herself with particular care, by seeking to copy Me more faithfully. For example, if she wishes she may take silence. (a) To make every Friday of Lent the Via Crucis [Way of the Cross], or recite the little Crown of My Sacred Wounds. If this can be done in common, at least once, it will give Me pleasure. (b) In order to wipe My Face, like so many other Veronicas, My spouses shall perform their actions in the best manner possible, not alone with the interior disposition, but also with exterior perfection. Purity of intention will be the whiteness of the linen, and fidelity and love in execution will be its delicate softness. (c ) They will take away the thorns from My Head by trying with exquisite charity to spare their neighbor all the little thorns of difficulty and little inconveniences, taking these for their own portion as much as lies in their power. whom I shall more quickly and clearly impress My Divine Features.